Just a couple of days now to the vote in what is likely to be an election that changes the face of Irish politics forever. Fianna Fail, the party which has dominated politics in Ireland for so long, could be consigned to the garbage can of history. If they come in fourth place behind Fine Gael, Labor and even Sinn Fein in terms of the number of Dail (Parliament) seats they win, it will be a disaster for the party. It seems incredible -- it's just a few years since Fianna Fail totally dominated the Irish political landscape -- but the level of anger in the country at the extent of the economic disaster means that the party is facing a political blood bath in the vote on Friday. Despite the change in leader and the number of senior party figures retiring, the voters have not been deflected from their determination to punish Fianna Fail for the mess we are in. And rightly so. No matter how they try to explain, excuse or even apologize for the wrecking of the Irish economy, Fianna Fail are at least 90% to blame for the mess as far as most people here are concerned. The result is that the party could come close to being wiped out in this election. If they get less seats than Sinn Fein they won't even be the main opposition party. That would mark a huge shift in Irish politics. Since they first came to power in 1932, Fianna Fail has been the natural party of government here. For all of my lifetime Fianna Fail has been in government almost non-stop, apart from a few brief periods when they were replaced by a Fine Gael led coalition, usually with Labor. Even when they were out of power and in opposition, Fianna Fail was still the largest party. The glory years when Fianna Fail dominated Irish politics went on for decades. But that was then and this is now. Now Fianna Fail may be reduced to a rump, a fringe party, and that beggars belief. Yet it is a real possibility. If that were to happen, it could mean the end of Civil War politics in Ireland at last. And there are a lot of people who think that would make a lot of sense. Explaining to an outsider the difference between Fianna Fail and Fine Gael has never been easy. The fact is that the two main parties only came into being because of the split on the national question when the state came into being. On economic and social policy -- indeed on almost everything -- the difference between them has been marginal, more imaginary than real. Fianna Fail came from the anti-treaty side, Fine Gael from the pro-treaty side. Apart from their different stances on the North and partition, very little has divided them in policy terms over the decades, since both are essentially centrist parties. Even the North has not been an issue since the Haughey era, with both parties supporting a policy of non-violence and unification by consent. In the last few years, with peace in the North, the division is even more absurd and the original reason for the existence of Fianna Fail has been undermined. So if Fianna Fail implodes at this election there will be a historical inevitably to it. Certainly the Labor Party and others on the left feel that Fianna Fail and Fine Gael should have merged years ago, allowing Irish politics to develop along left and right lines, like in most countries. 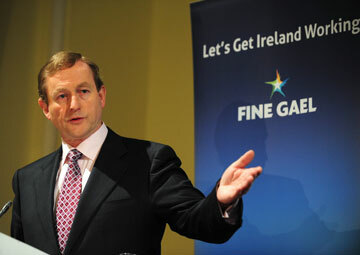 Logically, what's left of Fianna Fail after this election should fold itself into Fine Gael. But although there is no policy difference between them of any significance, that's not going to happen. They -- and us -- are still prisoners of our history. Pick up an Irish newspaper these days and you will see Fianna Fail being written off. But I'm not so sure. They are definitely going to take a hammering. But the division in Irish politics between Fianna Fail and Fine Gael is tribal. It's in the blood. My instinct is that Fianna Fail will survive and will get third place ahead of Sinn Fein. It is still too early to write the party's obituary. Voters have short memories, and a few years of cutbacks and misery under Fine Gael could see Fianna Fail return again like a Republican Lazarus. The other big question in this election is whether Fine Gael can get enough seats to form a single party government (perhaps with the support of a few independents) without needing the Labor Party. It's close, according to the polls, and there is also the factor that our voting system usually gives the biggest party a seat bonus. There are two ways of looking at this. Firstly it is possible that the seat bonus may not happen this time and that Fine Gael may not do quite as well as everyone expects. If that happens the most likely outcome will be a Fine Gael/Labor Party coalition, with all the compromises on policy that means. But decisive, coherent leadership is what we desperately need right now, not fudged policy resulting from confused compromises. Secondly, it is possible that the electorate will see this and that more of them will go for Fine Gael in the interests of getting a strong single party government to sort out the unprecedented mess we are in. The Labor Party's flip-flopping on taxation and their posturing on a renegotiation of the bailout deal have not been convincing for a lot of the middle-class voters who are swinging away from Fianna Fail. It is these voters who will decide this election, not the core Fianna Fail vote which is likely to stay with the party in spite of everything. The very latest polls have differed slightly in their figures but not in the overall trend. That trend shows Fine Gael gaining momentum and tantalizingly close to an overall majority. And it shows Labor slipping, despite all the talk a few weeks ago about Labor ending up as the biggest single party and Eamon Gilmore being a possible taoiseach. In fact Labor is so desperate now that they have switched their message. Now their message is that an overall majority for Fine Gael would unleash the right wing streak in that party, and having Labor in a coalition is essential to protect ordinary people from extreme cutbacks. Fianna Fail is way down in the polls, at around 16%, but at least that is up on where they were, a pitiful 12%. Which shows, as I was saying, that their core vote is not going anywhere. It's possible that by election day on Friday, Fianna Fail will have crept up another point or two, which will get them well ahead of Sinn Fein. Given his weakness in debate, his reliance on prepared sound bites and the impression he gives of not being fully on top of the complex economic problems facing the country, that is quite an achievement. One thing that appears to be working in Fine Gael's favor is its refusal to minimize the problems we face, or to pretend that there is some soft option we can take to avoid or lessen the huge economic adjustment that must be made here over the next few years. Fine Gael has not tried to sweeten the medicine, and it has not made promises that cannot be kept. It has also shown that it is willing to make radical changes to the political system that has failed us so badly. The Fianna Fail leader Micheal Martin is talking a lot these days about the need for political reform, but this is very much an eleventh hour conversion. Kenny, on the other hand, announced over a year ago that he will shut down the Seanad (the upper tier of the Irish Parliament) as part of a complete overhaul of our political system. Fine Gael has also been brave enough to tackle one of the great sacred cows of Irish politics, the Irish language, promising to end the compulsory teaching of Irish in our schools. And if they are prepared to do that, then maybe there is hope that an era of real change is ahead of us, free of the can’t and hypocrisy that has bedeviled this country since the foundation of the state.